Now that we’ve got the sales pitch out of the way, let’s commence with the blog post proper. I arrived in Chile on September 4th after a 21 hour bus ride from Lima, Peru. I will save those stories for another time. You can read my previous blog post about the trials and tribulations of getting my Peru and Ecuador passport stamp here. I’m currently typing this blog post at my hostel in San Pedro de Atacama. This is one of the most unique and surreal towns of all my travels so far. It’s a like a mirage in the middle of the driest desert in the world. I’ve enjoyed hanging out with my friend Marlene from France most of the day after arriving late last night on the bus from the nearest city Calama. There were no seats available so I sat on the steps until reaching my destination. It wasn’t comfortable but at least I got a discount on bus fare. Every cloud has its silver lining. I was walking through the dirt streets at night admiring the starlight, shining brights like diamonds. I couldn’t find my hostel so I asked for directions and a friendly woman about my age gave me a ride in her bite-sized car to Aji Verde. We exchanged a kiss and parted ways. Customary social etiquette in Chile. I checked in and slept on the couch for a few hours before leaving to find another place to rest my weary head. My current plan is to say in the Atacama for 3-4 days before continuing onward to the salt flats in Bolivia and Argentina on my way to the famous Igazu Falls at the intersection of Paraguay of Brasil. I’m trying to decide whether to rent a camper van to explore the Atacama Desert for 2 days. The only problem is I can’t drive stick shift. This is a once-in-a-lifetime opportunity and I can’t think of a better place to learn the art of the clutch. After all, the majority of rental cars in South America are manual transmission and maybe someday I will own a Porsche or Ferrari… not holding my breath. I was able to work out a 30% discount with the owner of Wicked Campers in exchange for professional photos and social media influencer status. 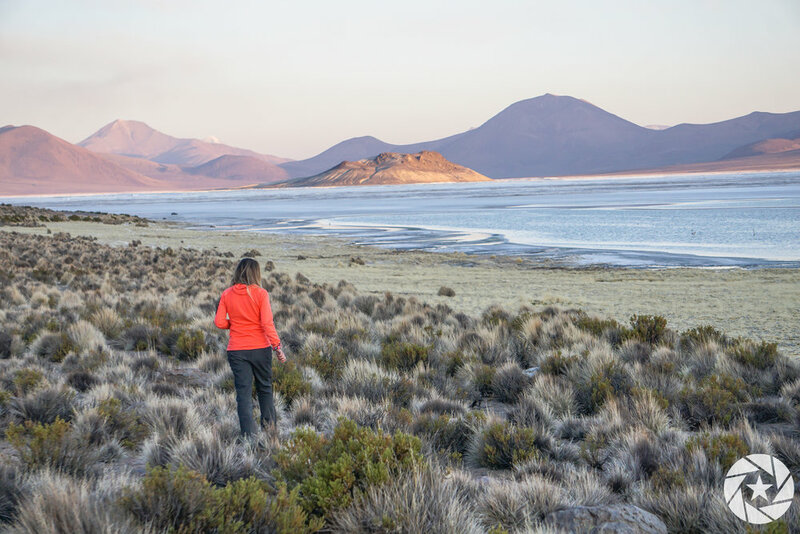 There’s just so many beautiful destinations to see in this part of Chile. It would be a shame not to experience and capture them in photos. The Atacama Desert is also one of the best places in the world for stargazing. The elevation, weather, and moisture level are ideal for appreciating our pale blue dot floating in an infinite Universe. 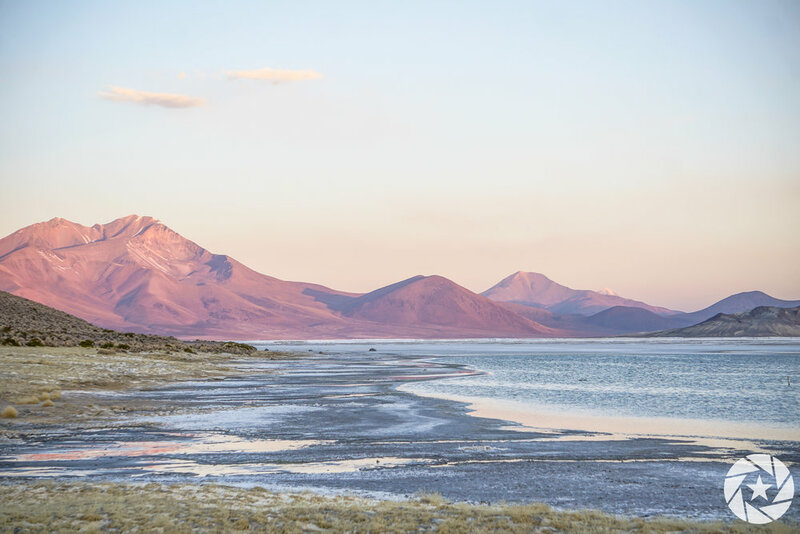 NOW I want to tell you about my adventure to the salt flats in northern Chile, an exotic landscape called Salar de Surire. It’s located far off the beaten path, about 3 hours southeast of the small town of Putre. I met a research team of about 8 people at Pachamama Hostel. We started talking, one thing let to another, and I graciously accepted the opportunity to join them on a daring research expedition. I had every intention of visiting these salt flats in the highlands along the border of Bolivia but wasn’t sure how to get there. Ask and ye shall receive! I recently discovered that hitchhiking is easy and safe in Chile. Me and a friend caught a ride from town to a checkpoint, then hopped on a semi-truck to Lake Cotacotani. Take a look at the beautiful photos from those locations. 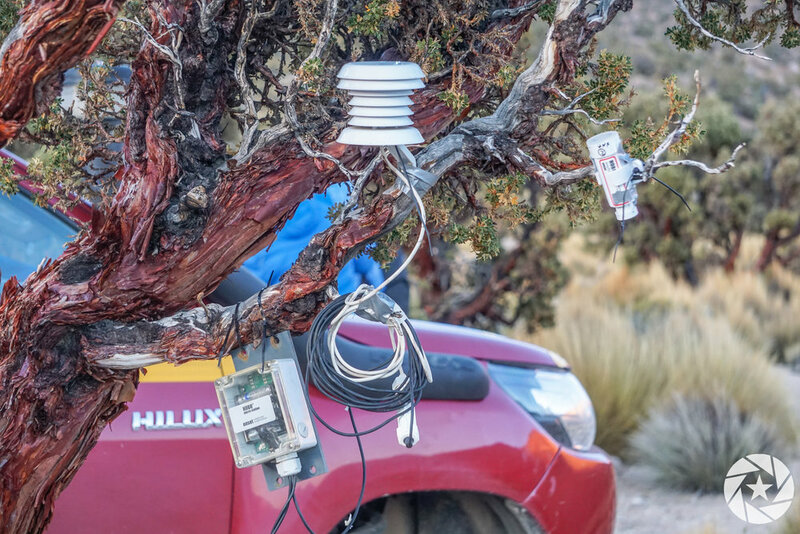 In the afternoon, we loaded up the 4x4 truck with all the scientific equipment, grabbed a few supplies, and hit the dirt roads. This was by far the most incredible off-roading experience of my life! Volcanoes and mountains surrounded us on all sides and went further and further off the beaten path. The journey is the destination. After 3 hours, we arrived at Salar de Surire just in time for a magnificent sunset. I quickly hopped out of the truck and ran to the salt flats like an excited child and took high-speed photos as the sun sank below the horizon. Pink flamencos dotted the pristine clear waters and flew into the distance as I tracked their motion with my camera. This is what you may call a Holy Moment. As a photographer, it’s often difficult to stay in the moment while also capturing it. It all depends on whether you want to preserve the memory in posterity or record it with your own optical mirrors called eyes. It wasn’t long before we arrived at the research facility. I was expecting a hotel or something. Of course it was nothing of the sort. This was a barebones rustic shipping container with metallic walls. Just to put it into perspective, you had to flush the toilet by pouring water into the bowl from a bucket. We unloaded supplies and ate dinner in dingy house next door. There was one fluorescent bulb to light the tiny room which included a fire place, television, and kitchen with table. I laboriously helped cut tomatoes, peel avocados, and drain the beans. The whole process was making me nauseous due to the extreme elevation. This was the highest altitude (5300 m) I’ve been at since hiking Rainbow Mountain in Peru. As we sat around the table, I started to feel dizzy and lethargic, fingers numb, my stomach was churning, and appetite very minimal. I was able to choke down part of a tortilla and black beans before retiring to my bed. I wasn’t prepared at all. Luckily, my friends left some warm winter pants and heavy coat. I was running a fever before we left town. Now it was only getting worse. I took a pill for elevation and fever before hitting the mattress. Waking up several times in a shivering fright, freezing feet, trying to get comfortable; I was still just happy to be here living on the edge. This too will pass, I kept reminding myself. I struggled to get out of bed at 5am in the morning due to aches and pains. After a light breakfast, we piled into the mobile research station and hit the road again. It was still dark outside as we climbed to higher elevation. Michael Jackson’s Greatest Hits was our soundtrack, thanks to our DJ Melanie. Definitely a memorable moment. After about 45 minutes, we reached the research site at 5500m. At this point you are probably wondering what was worth all the effort to reach this exact spot? Surrounding us were the highest growing trees in the world. A few of them were covered in scientific instruments and tinfoil for analysis. I started taking photos as the sun came up over the salt flats and the team unloaded equipment to test for photosynthesis and other things I didn’t fully understand. We headed back to the “agricultural center” to analyze the results. Not me. I passed out teeth chattering until a few nice ladies from Belgium brightened up the room. I woke up dazed and confused but played it cool. After another hour, we piled into the truck (the girls sitting in the back) and drove to collect our friends at the testing site. I mostly sat in the truck listening to podcasts for what felt like hours. This is one of the main reasons I prefer to travel alone. I can’t stand waiting on other people to get ready. But I force myself to be patient. Afterwards, we soaked in the natural salty muddy sulphur hot springs surrounded by mountains. I was feeling like a new man and fully rejuvenated. The girls from Belgium went with another group to a party in a nearby town. We drove back to the research facility, packed up all the belongings, and took off for Iquique on the coast. They dropped me off and I walked the streets for about 3 miles searching for my hostel. I was so relieved and exhausted that I passed out immediately after a hot shower. Thanks for taking the time out of your busy day to read my blog post! Hopefully it inspires you to take more risks and say yes to new opportunities! Enjoy my favorite photos from road tripping with a few of my favorite allies, to quote the famous Red Hot Chili Peppers song.